Branding is important, especially on social media. To illustrate my point, think of some of the most iconic restaurant and food brands in the world. As an avid coffee drinker, Starbucks comes to mind first. When I walk into a Starbucks, I’m instantly greeted by a pleasant aroma, coffeehouse music, warm interior design, friendly baristas, and that familiar cup of coffee. Their offerings may change through the seasons, but I know that every time I visit a store or hit that drive thru line, I’ll have a similar experience. The experience a customer has in your restaurant should match the experience they have on your social media channels. Starbucks does a great job of capturing the personality of their different offerings and adapting their posting style seasonally—all the while staying true to the Starbucks brand. 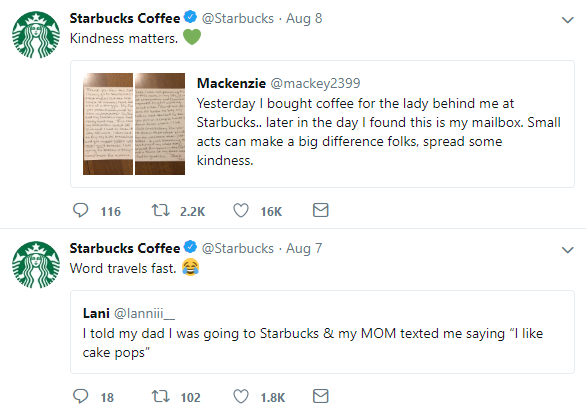 When you read their social media posts and comments, Starbucks is active and friendly, answering users’ questions and interacting with their comments—mirroring the customer service you’d experience at one of their stores. 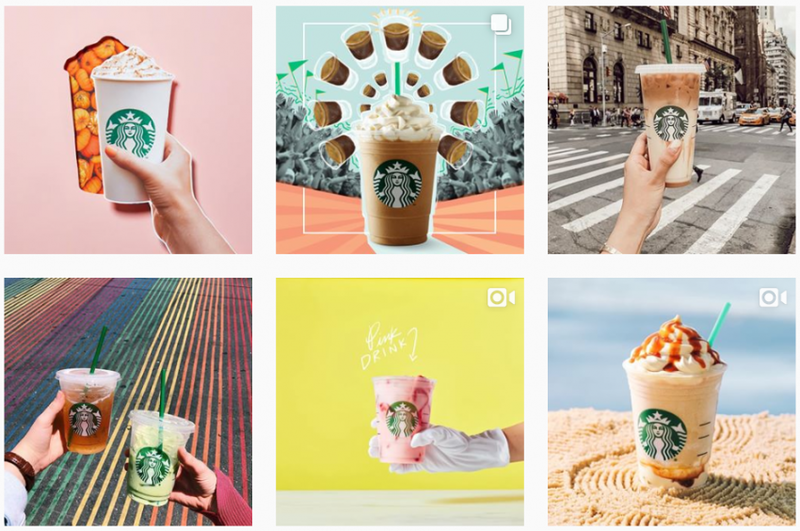 From the examples above, you can see that Starbucks’ social media feels attainable and recognizable—the images look like what I’d see in my social feed from my friends after they pick up their Pumpkin Spice Latte, and their friendly engagement with users humanizes this giant brand. Not to mention, it makes me want to get in my car right now and go pick up a drink, reinforcing the fact that 75% of people purchase a product because they saw it on social media. Know, or build, your brand, and make sure it roots itself at the foundation of your digital presence. Picture this: You’re deciding what restaurant to go to for dinner and decide to check out their social media profiles. As soon as you land on the page for a first restaurant option, you see that their last post was a Happy New Year greeting from 2017—well, that doesn’t help your choice. 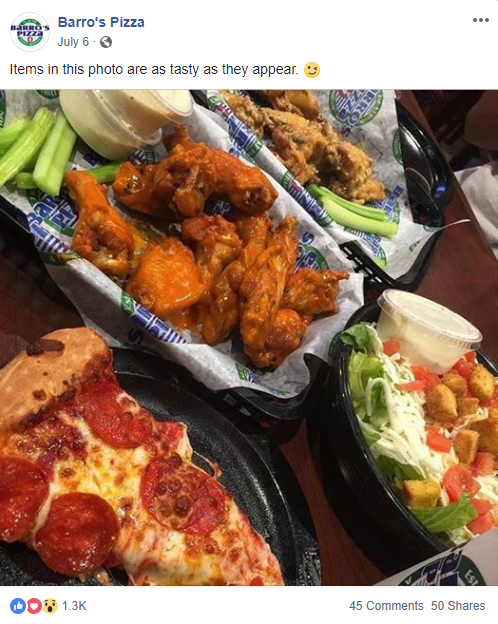 You then decide to check out a second restaurant and as soon as you open their page, you’re greeted with up-to-date posts and people talking about how that dish pictured was the best thing ever. If you’re judging on their social media alone, chances are, you’ll choose restaurant number two for dinner. Since 49% of people use Facebook to search for restaurants, it’s essential to keep up your social media profiles to ensure your restaurant is at the top of the list in your customer’s consideration set. Some tips —choose to be active on platforms that your customers are on, post often—but not too often where you become intrusive, and post around times your customers will be eating, or about to eat. As for what to post? Keep reading on. Your customers know your restaurant and the food you serve. 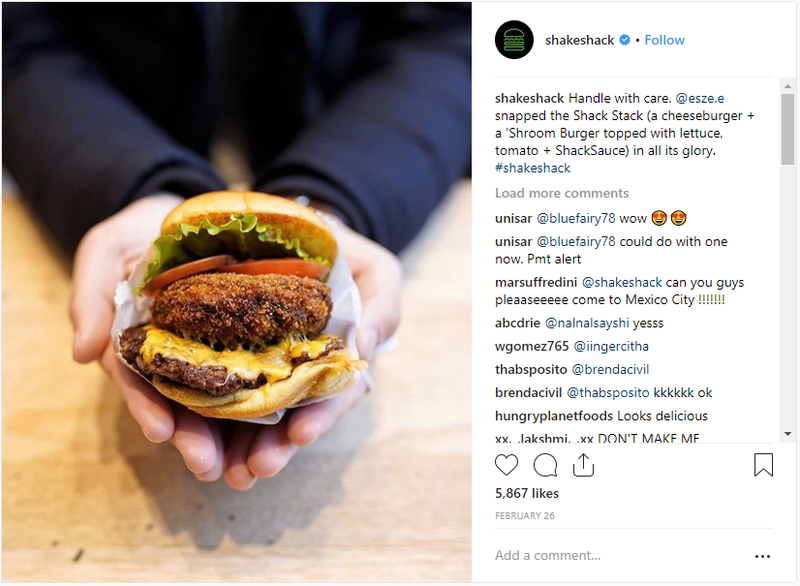 If you were to publish a stock photo, or an overly staged photo of your product, they’d probably know that your actual food doesn’t match what your publicizing, right? Don’t trigger the keyboard warriors that will directly call you out with a, “I’ve been there, and my food never looked like this,” comment. Authenticity is huge in social media, so stay true to your brand and build up a library of authentic imagery to accompany your posts. These images could come from a formal photoshoot, or even better, user-generated content. Approximately 93% of consumers find user-generated content (UGC) to be helpful when making a purchasing decision, so make it convenient for them by featuring UGC in your posts often. These images can be attained in a few different ways, including byproduct of your social media influencer marketing campaign, or by finding it free from your customers directly. Search images users tag you in, mentions of your restaurant name indirectly (when someone doesn’t tag you), images taken at your restaurant location, images found when searching a hashtag associated with your restaurant, and shared with you directly in a comment or message. Always ask permission before reusing someone’s image, then add it to your photo library for future use when they accept. As a bonus point, it feels really cool as a customer to see a restaurant you enjoy compliment your image and reuse it in their marketing efforts. Many believe that the Pareto Principle, or the 80/20 rule, is important in many aspects of marketing, including social media. In the social media world, that means that 80% of the time you should be posting non-promotional, shareable content, and 20% of the time posting promotional content with a call-to-action. This means that restaurants should limit your daily specials or “buy a gift card” posts to just a few times a month, and instead focus on being social and building an engaged community, especially with Facebook’s newsfeed algorithm updates. I can’t spill all the family recipes, but one of my biggest tips is to let your food do the talking. The brain processes visuals 60,000 times faster than text, so an appetizing image can make a large impact on a user—especially when it’s food! Even if you post a question or directive in your post copy, often people will comment about how the food pictured looks or how it’s their favorite thing to order from your restaurant. Entice this behavior, and the social proof that comes from users speaking highly of your business on their own accord. The following post is an example that tempted many hungry and loyal Barro’s Pizza customers. We live in a world where people desire instant gratification. If something goes wrong with their order, they want it fixed, and they want it fixed now. I was surprised when I first learned that 42% of people expect a response within 60 minutes of contacting a company through social media for customer support. Oftentimes, this can’t be a realistic response time, but there are some things you can do to establish more transparency for when your customer can expect to receive a reply. Among these are publicizing your “online hours” when you are actively monitoring the page, and setting up Facebook Messenger tools, like the Messenger Greeting and Away Message. Out of any industry, the restaurant business may be the most reliant on customer reviews, with 93% of consumers saying reviews impact their decisions, and 84% of consumers trusting them as much as a personal recommendation, according to Brand 24. Negative reviews aren’t always unavoidable—customers get heated and leave 1-star reviews for seemingly trivial things. It’s important to respond publicly and show your customers and the reviewer that you’re making an honest effort to resolve the issue. Plus, making it up to the customer will almost always keep them coming back through your doors. The same goes for positive reviews—your customers took time out of their day to recognize your restaurant, so thank them to encourage more interaction from them on your page in the future. I hope you savored this tasting menu of important ingredients for your restaurant’s social media presence. Build off these and get ready to see your community grow and engagement soar. Ready to get cooking?